There is something relaxing and therapeutic about spending a weekend afternoon testing out a new recipe that takes hours and stages to prepare. This is exactly what I did a couple of Saturdays ago after quite a few weeks of weekend travel. My experiment this time was cheesecake, which was something that had previously seemed to be too intimidating to attempt. 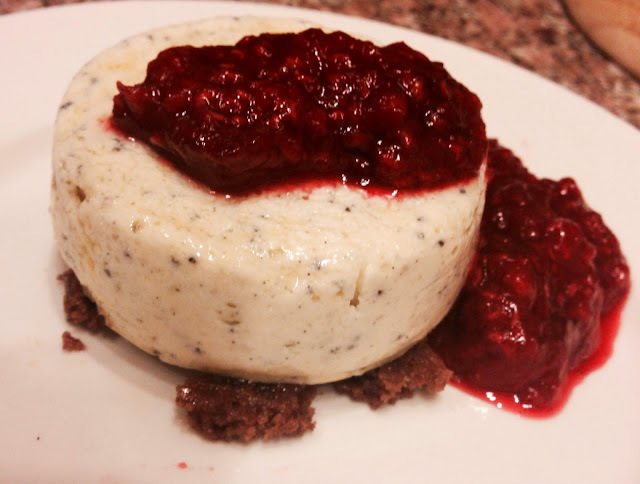 However, after perusing through Food & Wine, Southern Living, Cooking Light, and a few other magazines, I felt inspired, and set out on my quest to create a lemon, poppy, and chevre cheesecake with steusel and a raspberry and strawberry compote. 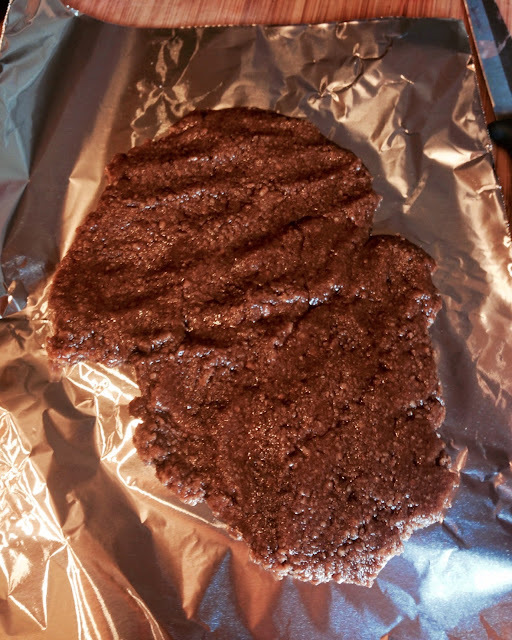 As most recipes I make, I found a great recipe that incorporated seasonal items and tweaked it to fit my tastes, be slightly healthier, and become a my creation. I also loved that this recipe makes individual portions in ramekins (everything is cuter in mini sizes! ), which was perfect for just the two of us, and would make a great treat to take to a small dinner party. Spray eight 4- to 6-ounce ramekins with vegetable oil spray and dust with sugar; tap out the excess. 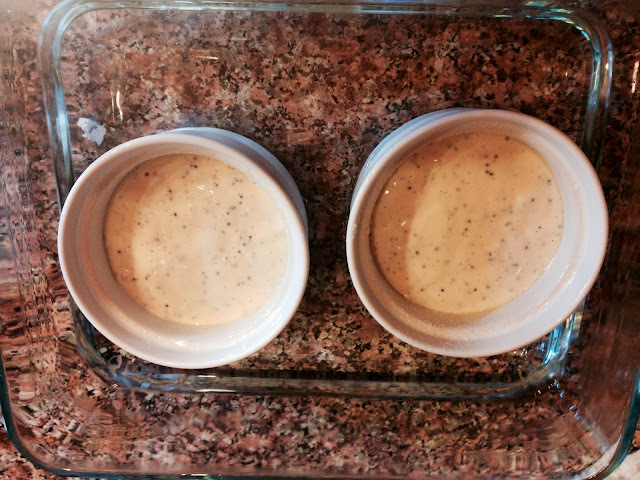 Set the ramekins in a large roasting pan. 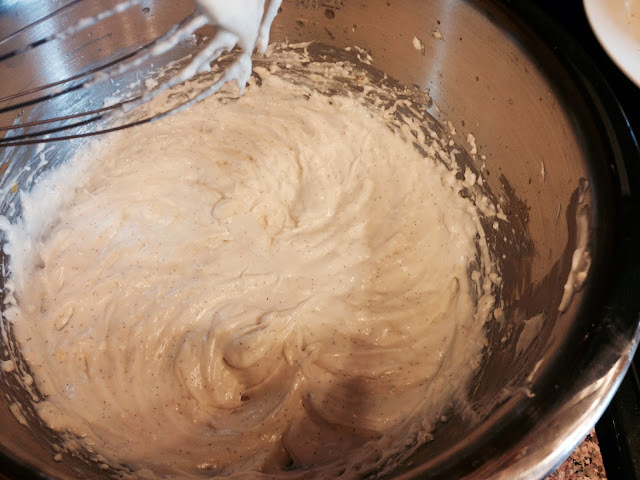 In a large bowl, using an electric mixer, beat the cream cheese, goat cheese and the 1/4 cup of sugar until smooth. 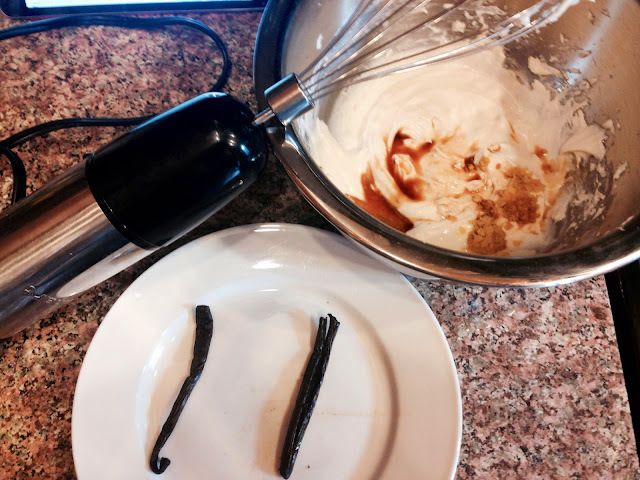 Split the vanilla bean in half and slice to remove the beans. Beat in the zest, lemon juice, vanilla beans and pure vanilla extract, and salt. I doubled up on the vanilla here, because I like a strong vanilla taste in cheesecake. Beat in the poppy seeds. Divide the mixture between the ramekins and set the pan in the oven. Carefully add enough hot water to the pan to reach halfway up the sides of the ramekins. Bake for 20 to 25 minutes, until the cheesecakes are just set. Remove from the oven and let cool in the water bath for 1 hour. Refrigerate the cheesecakes until cooled completely, 3 hours. Cut your strawberries into fourths and slice down one side of your vanilla bean. 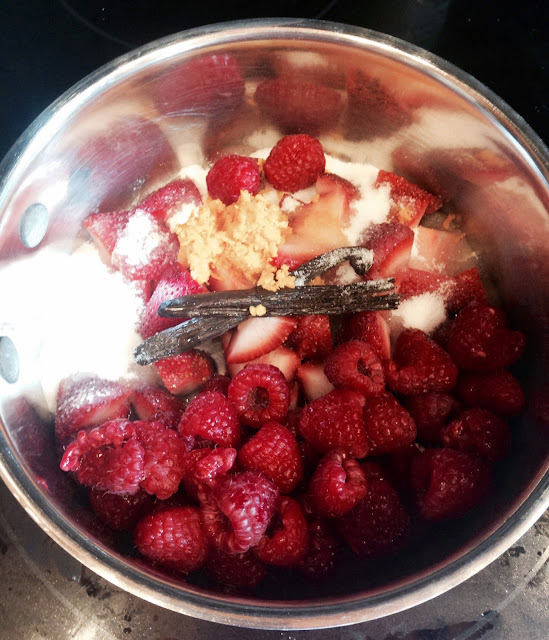 In a medium sauce pan, add your strawberries, raspberries, sugar, orange zest, orange juice, lemon juice, St. Germain, vanilla bean, and salt. 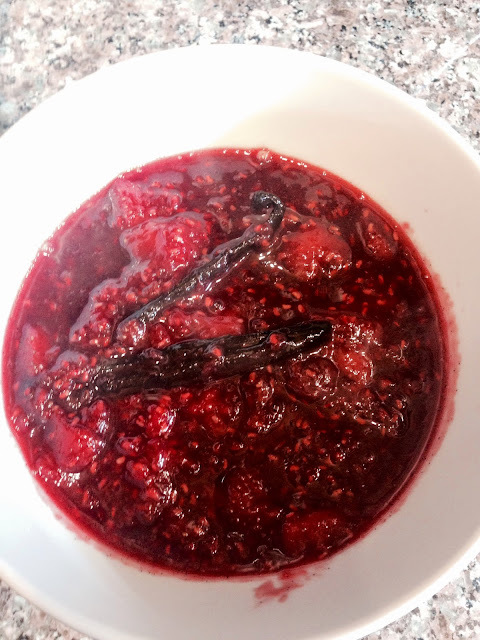 Cook over moderate heat, stirring frequently, until the berries are breaking down and the excess juice cooks off, and the liquid is slightly thickened (to a syrup like consistence). Transfer the compote to a bowl and let cool. Discard the vanilla bean. 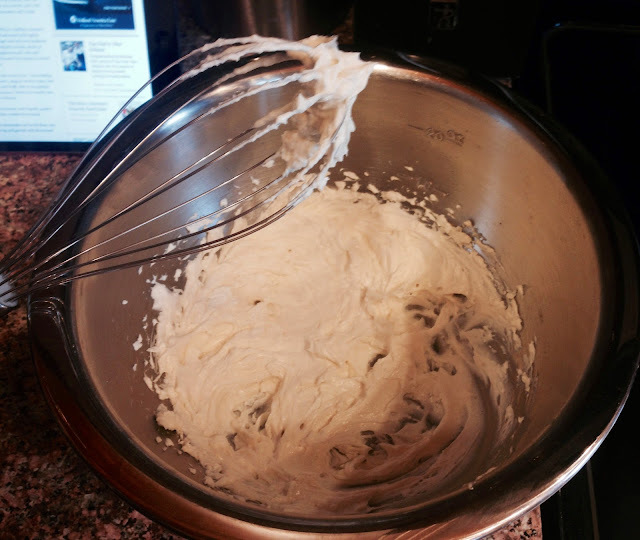 In a bowl, using an electric mixer, beat the butter, sugar and lemon juice until fluffy. Beat in the graham cracker crumbs, flour, salt and cinnamon. Pat the streusel flat onto the baking sheet and freeze for 10 minutes. Bake the streusel for about 20 minutes, until fragrant, golden and firm. Let cool completely, then crumble the streusel. IV. Get ready to eat! Place the streusel crumbs on the plate (put enough to cover the size of the bottom of your ramekins). 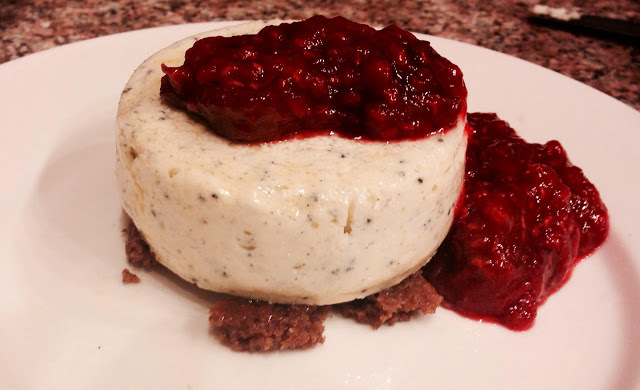 Run a thin knife around the cheesecakes and invert them onto plates. Spoon the compote on top, and serve right away! Since I substituted some fat free ingredients making the cheesecake come in at only 221 calories, I didn’t feel quite as bad indulging in second one the next night. Hope you enjoy these light, fluffy, refreshingly lemony cheesecakes at your next summer dinner!